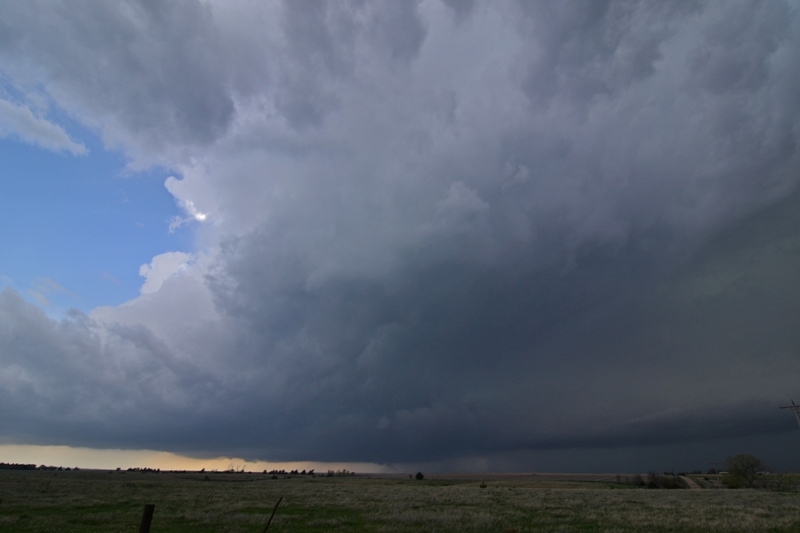 Storm on the dryline with well defined inflow tail into the base near Beaver City, NE. Inflow was quite cool at this point. 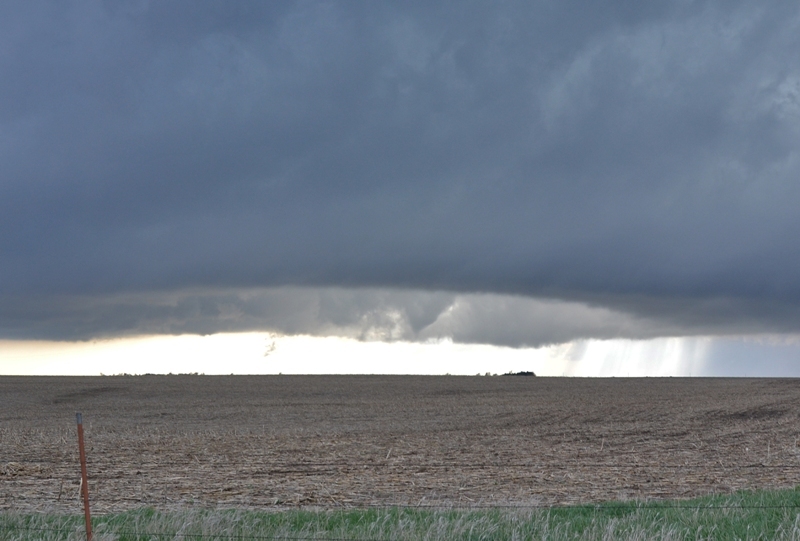 A closer view of the terrific structure/shape of the inflow tail into the base of the storm near Beaver City, NE. Funnel starting to form out of the mothership storm base near Oxford, NE. Initial tornado touchdown near Oxford, NE at 5:17pm. Tornado with debris cloud starting to increase in size. 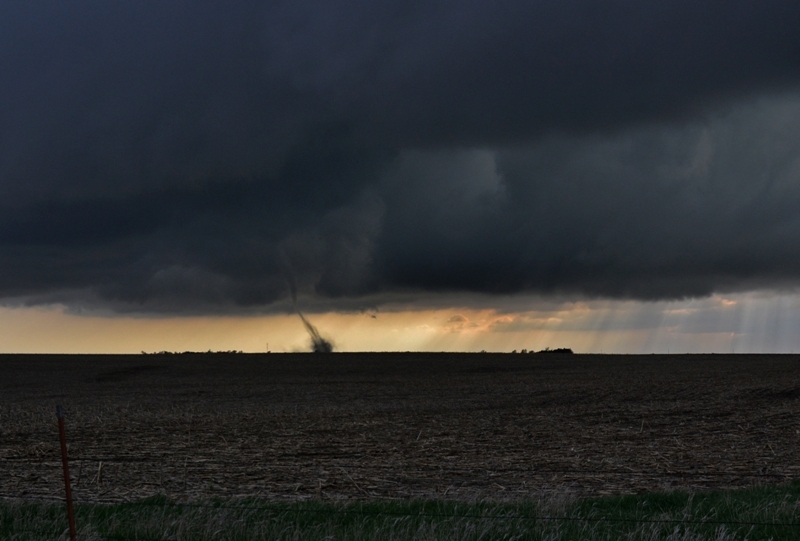 Beautiful rope tornado near Oxford, NE at 5:18pm. Zoomed out view of the tornado with nice backlighting. 04-14-2012 CHASE LOG: NEBRASKA There was a lot of hype leading up to this event with the Storm Prediction Center (SPC) issuing a moderate risk on Day 3 and high risks on Days 1 & 2. This was all for good reason as a deep and strong upper trough was set to eject out of the Rockies and lead to a volatile weather situation with a risk for long track tornadoes, extremely high winds, and large hail with any storms that would materialize through much of the Plains from TX to NE. The set-up included an area of low pressure centered across northeast CO with a warm front lifting to near the KS/NE border and a dryline extending south of the low into western KS. These fronts were expected to be the focusing mechanisms for an outbreak of severe weather and tornadoes, especially right near the warm front and in the warm sector ahead of the dryline. Wes Hyduke and I left Burnsville the day before and stayed in Omaha, NE for the night, fully expecting to have to drive west into NE the next day. We awoke to thick fog and low stratus and realized the moisture had returned and we were clearly north of the warm front. The system had slowed down from previous days and we realized that we had to position further to the west, so we left early and drove on I-80 to Grand Island, NE to reevaluate there. Towards the noon hour, convection already started to break out across western KS and quickly move to the northeast. A PDS tornado watch was issued 10:45am as a result of this first round of convection developing due to a strong low level jet in air that was already unstable as noted by the 1500-2000 j/kg of MLCAPE and 40-60 knots of effective bulk shear. We decided to head south on Hwy 281 out of Grand Island to meet up with these initial storms near Nelson, NE. These storms had been tornado warned but the main threat was large hail and the storms were already starting to congeal into a cluster as they moved northeast into NE. These were not impressive looking enough to keep us on these storms as we thought the main show would be later in the afternoon along the dryline. A mesoscale discussion was issued at 1:41pm highlighting this risk across southwest NE into northwest KS. As more intense supercells developed along the dryline further south in western KS and western OK, and were quickly becoming tornadic and cyclic, we almost decided to bail on our northern area and head to the northernmost cell approaching the Great Bend, KS area, which later produced a long track tornado that passed very close to Salina, KS. This area had extremely high storm relative helicity and had MLCAPE approaching 3000 j/kg. We decided to stay north on the dryline as there were some cells starting to get going and thought we had just as good of a chance to see a tornado here, although in an environment that was less unstable than further south. These storms were slow to develop for some reason, but one storm did manage to break through and intensify. This was our storm. We traveled northwest from Alma, NE towards Oxford. The storm was looking better and starting to get some incredible structure and fast, albeit cool, inflow air with an impressive tail cloud into a lowered base. 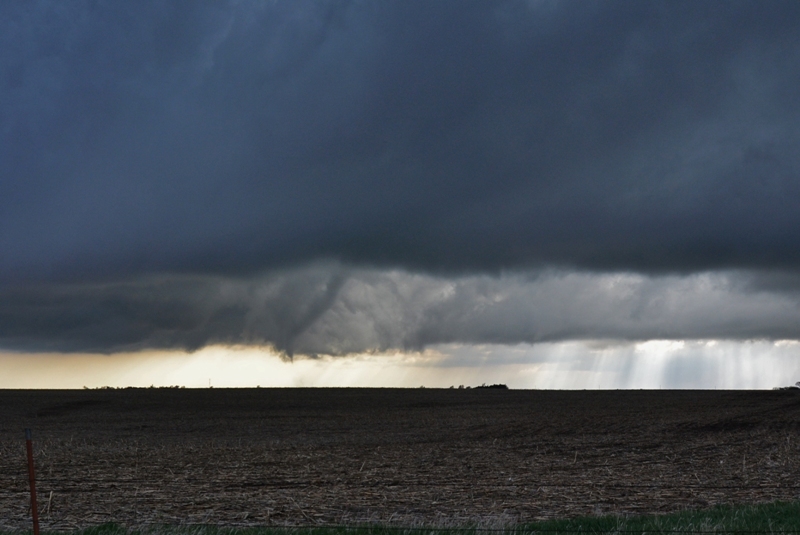 A wall cloud soon developed around 4:30pm and we witnessed a rope tornado for around 3 minutes near Oxford at 5:18pm. After the tornado died, we followed the storm on Hwy 34 northeast in hope of the storm producing again, but that ended up being the only tornado that storm produced. We did witness a large funnel that was ¾ of the way to the ground (may have touched down) near Gibbon, NE when the storm was not even tornado warned but had a nice couplet on radar. You can see this at the end of the video below. It soon became too dark to see much so we traveled to Columbus, NE to have our steak dinner after a successful chase! Overall, I thought this would be a bigger day for tornadoes in NE than what it ended up being. It was clear to me that it was just not as unstable with slightly lower dewpoints this far north as what was taking place in KS and OK, although the low and deep layer wind shear seemed to be similar.